Glengoyne Highland Single Malt Whisky has launched a special limited Edition ‘Auld Enemy Dram’ in time for Father’s Day – 17th June 2012. The Auld Enemy Dram has been launched to recognise and celebrate the great sporting rivalry that exists between the two great nations of Scotland and England. The Glengoyne 1990 Single Cask bottling makes the ideal gift for Father’s Day with its robust nose, powerful palate. The Auld Enemy Dram has a rich mahogany colour with a heavy and robust nose of hazelnut, prunes, cocoa powder, and liquorice with BBQ spice. The palate is powerful with good balance of red apple, raisins, wafer cone and subtle citrus. The finish maintains strength with increased fruits and dry spice. All proceeds from sales of The Limited Edition Glengoyne ‘Auld Enemy Dram’ go to support Help for Heroes* and The Bill McLaren Foundation*. Award-winning Glengoyne is one of the leading premium malt whiskies in the world and has been distilled at Glengoyne distillery since 1833. Using methods passed down for generations, Glengoyne is made with knowledge, passion and craftsmanship, a key combination for a perfect Father’s Day gift. Glengoyne is a subtle, complex whisky in which all of the delicate flavours are freely allowed to express themselves The full Glengoyne portfolio consists of the 10 Years Old, 12 Years Old Cask Strength, 12 Years Old at 43%, 17 Years Old, 21 Years Old and Vintage 1972 as well as other limited edition special bottlings. Glengoyne 10 Years Old is a great introduction to this award winning range, golden in colour with a sweet nose, warming mouthfeel and a smooth and delicate palate leaving a fruity finish behind. For the very first time Glengoyne has used first fill bourbon wood in one of our core range, Glengoyne 12 Years Old. There is also less sherry wood as a result giving a completely different taste and nose. The Glengoyne 17 Year Old probably the most famed of the core range has a medium golden rich appearance, a hint of Vanilla and a rich spicy oak finish. A more concentrated, equally well-balanced palate of flavours, though it still retains the same clean, delicate taste as the 10 Years Old. 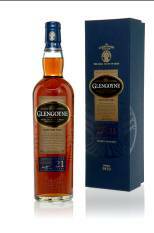 The Glengoyne 21 Year Old has a deep copper appearance, which leaves a spicy, warm and dry finish. This Glengoyne Highland Single Malt Whisky achieves the optimum balance of flavours and the maximum benefits from specially selected 100% first fill European Oak Sherry casks. The Glengoyne core range is available online at www.glengoyne.com and from all good UK specialist retailers and the 10 Years Old is available from Sainsbury's and Asda in Scotland.